Zinio and Overdrive satisfy the need to read...Now! Have you ever found yourself wishing for a good read at the last minute? Something to take on a weekend away, plane flight, doctor's surgery wait or for the spare 1/2 hour you've found in your day? With a little pre-planning your wish can be fulfilled. Choose from the 100's of magazines Sutherland Libraries have available for you, supplied online via Zinio, or the 1000's of ebooks and audiobooks supplied online via Overdrive. Register and set up these two services today, for effortless borrowing in times of desperation! Follow the step by step demonstration in the Getting started with Zinio video, and take note of the Before you start with Overdrive information, to ensure a smooth registration experience. Overdrive titles can be found in Encore or in Overdrive itself, with a great range of Fiction and Non-fiction titles to choose from there is something for everyone. Overdrive allows you to borrow titles for a 3 week period, (shorter if you wish), renew them and place a hold on them, if they are out on loan. One can have a maximum of 10 titles out at a time, whether that is a mix of eBook or eAudio. TIP: Overdrive titles do not appear on your regular library online account. A separate Overdrive account is created for each member and loans, returns and holds etc. are managed from there. If you are using a mobile device use an app. Click here to see what's available in the the following categories right now! The headphone icon on the top right of a cover denotes an eAudio title, also available from Overdrive, with the titles coming from over 2,000 publishers, (including HarperCollins, Random House & MacMillan) and new ones being added all the time, there is something for everyone. In a recent update to our Overdrive audiobooks and ebooks service 2 new features were added that users of this service will want to know about. Read the blog post which details these additions to the service..
Zinio is a digital magazine service available at Sutherland Shire Libraries as part of its range of online collections. 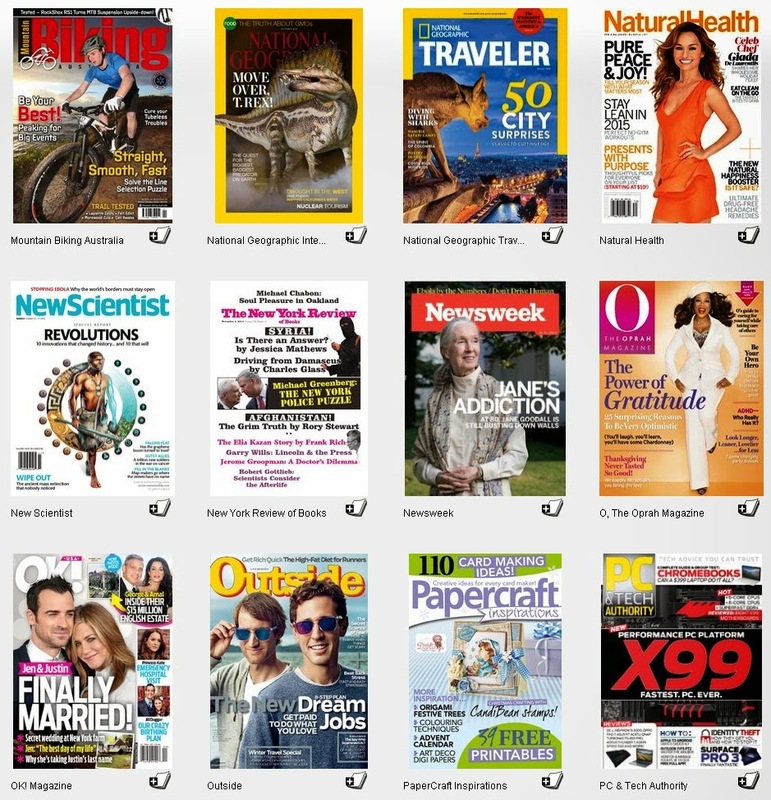 Browse this list of popular magazine titles that can be downloaded onto many devices including PC, Mac, iPad or Android tablet. Zinio enables you to move seamlessly between text, graphics, animated illustrations and videos; making reading your favourite titles an interactive experience. The current issue and back issues (from the start date of the library subscribing to that title) are available for download. Once downloaded to your device they remain yours until you delete them! Titles cover a wide range of interests and age groups including Elle, Gardening Australia, Harper’s Bazaar, MacUser, PC & Tech Authority, Popular Mechanics, Popular Science, Donna Hay, Taste, Star, OK, Vogue Australia, Weight Watchers, Gourmet Traveller, Australian Womans Weekly, New Idea and many more. You can use Zinio from home on a PC, laptop or mobile device, or on the go using a smart phone or tablet. Get the app that works on your device. If you wish to know more come in and ask our staff.